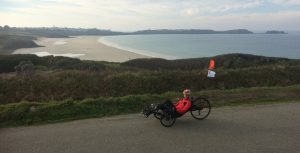 When Hélène Puccio presented during the AFAF’s general assembly in March 2016, the idea of importing the concept of Ride Ataxia and creating a race in Europe with Kyle Bryant, I immediately wanted to participate. The project has matured with the power of work of the entire team led by Anabella, Hélène and Benjamin Puccio and thus the “Peloton de l’Espoir” was born. 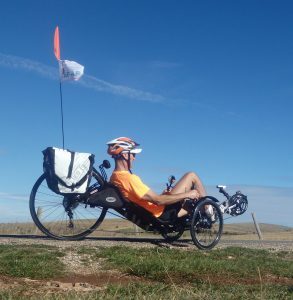 My loss of balance pushed me to change my bike and move to a recumbent bike. I contacted Kyle, and I ended up choosing the same bike as him. I was lucky to find a similar secondhand bike at the end of June in Paris. End of September, I went hiking to visit the Tarn Gorge and the Aubrac Plateaux, 400 km around Millau. During the winter weekend, I continue to go out regularly, go along the coast and swim and try to maintain a physical level essential to compensate for the evolution of the disease. So, for me, my investment in the Peloton of Hope means also learning to live differently, meeting new people, sharing moments of life and above all contributing to fundraising for research. So, looking forward to seing you in Strasbourg or Lentilly to live together this adventure.